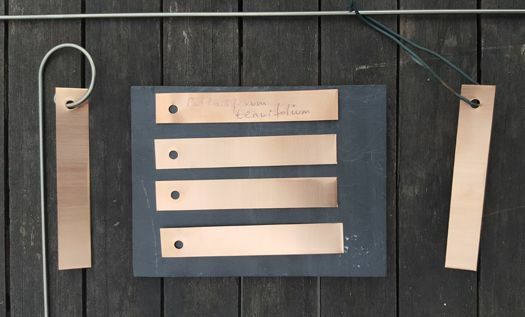 These thin copper labels, sometimes referred to as copper tags, are a wonderfully soft material on to which you emboss the name using an old biro/pen. It is not the ink you are looking for but rather the impression. The copper will dull down over time and may attract a covering of verdi gris. We imagine these labels will last forever but have not been around long enough to test this! Unlike the other copper labels in this section, CH11 will not take engraving as it is too thin. PS - some of you ask if we sell copper wires to attach the labels to the plants as some of our competitors do. As far as we are aware copper is toxic to many plants so if the wire chafes against the plant then in time you may need a new plant! We do however sell green plastic coated steel wire which will do the trick.